It’s not every day that you get to speak to one of the legends of the American gaming scene. Imagine then, how giddy I was at the chance to chat with Steve Woita, co-creator of such Genesis hits as Kid Chameleon and Sonic Spinball. A true pioneer, Woita has been around since the birth of the industry and has worked on projects at several big-name companies. He got his start at Apple and quickly gained experience once he began to work for Atari, where he was the creative force behind several games including QuadRun (supposedly the first home video game with voice without the need for a hardware attachment). After stints at Tengen and MediaGenic, Woita arrived at Sega, and it was here that he gave all of us Segaphiles some true gems that are still loved today. Eventually, Woita left Sega for greener pastures and now operates his own game company, Tinygames, where he continues to do what he loves best – creating small games that challenge both the programmer and gamer alike. Mr. Woita was recently kind enough to sit for a spell and share all the juicy details about his time at Sega. Sega-16: How did you come to work for Sega? 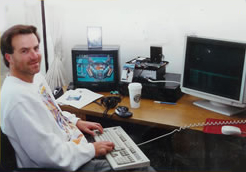 Steve Woita: I interviewed with Mark Cerney who headed up the STI (Sega Technical Institute) division of Sega while I was at Tengen, a division of Atari at the time. My cousin in-law Scott Chandler, who was currently working for Mark at STI, got me the interview. At the time, the STI group was located just down the street from our Milpitas Tengen/Atari building. I got a call while I was at work at Tengen and it turned out to be Mark Cerney. He said: “Hey, why don’t you come by and we’ll talk…” I said “ah, hmmm, o.k…” I had just finished playing tennis and I had no time to get into other clothes so I walked down the street to the Sega interview with my Bart Simpson “under achiever” t-shirt and tennis shorts! The interview went very well, but I later took a Job at Activision/Mediagenic. I was their first Super Nintendo games programmer. After that place got renamed to just Activision, they ended up moving down to LA. I didn’t go with them, and they laid me off. So I ended up talking to Mark Cerney again, and he hired me as a senior programmer. My first project for him was Kid Chameleon. Sega-16: You helped wrap up production on Sonic 2. How was the atmosphere surrounding the Blue Blur’s first sequel? Steve Woita: I helped on the last two weeks or so of this project. There was a huge amount of energy around this game. Imagine working on something that you really know is going to be hit. I wished that I could’ve been involved with this game from the ground up, but I was working on something else. I really did like the whole Sonic team, lots of fun. Sega-16: I can imagine that the pressure on you guys must have been amazing. True? Steve Woita: I can’t speak for the Sonic team and since I was just helping out for a couple of weeks, I don’t remember much pressure. I had way more pressure on me working on Kid Chameleon because the game was unknown at the time, so we had to prove to marketing and everybody else that we thought we had a good game our hands. It’s always extremely difficult to do an original game idea and hardly any of them make it to the market place, so there was extra pressure because nobody outside of our development group knew what we were doing and if it would sell. Sega-16: The Japanese and American design teams reportedly got along quite well. What was it like working with Yuji Naka? Steve Woita: The Japanese and American design teams really did get a long well. I remember when Yuji Naka first came over from Japan and he followed another co worker and I in his car over to the local Round Table pizza. We ate and laughed a lot. Sega-16: Sonic Spinball was a pretty unique and fun concept at the time, and the Sonic character worked quite well in the pinball environment. Who came up with the idea, initially? Steve Woita: I believe it was Justin Chin (creator of the Jedi Knight series of games). I think he was made an offer over at Lucas Arts and he took it, then Peter Morawiec took over with the assistance of Hoyt Ng. Sega-16: Was there ever any resistance from Sega (of Japan, especially) to put Sonic in a pinball game? Steve Woita: I never heard of any resistance. I’m sure if Yuji Naka didn’t like the game, he would’ve done something about it. Yuji Naka was in total control of anything Sonic and no one had the guts to challenge him on any issues, and I loved that! 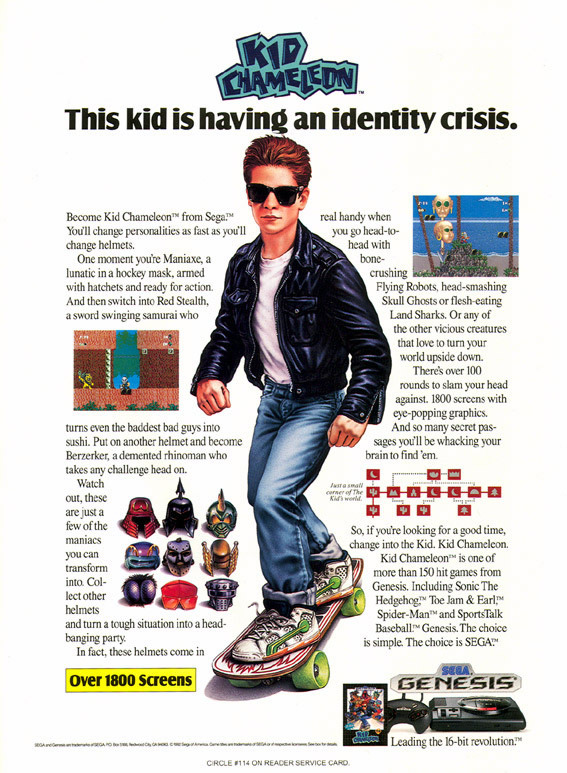 Sega-16: Kid Chameleon is famous for its length, and many gamers have yet to beat it in a single sitting, due to its lack of a password or save feature. You once mentioned that this was done on purpose. Why? Steve Woita: There was a lot of talk about putting battery back up in the game so people could come back and play it where they left off. I was totally against the battery backup because of its shelf life of about five years, so after five years you’d have to leave the system on anyway. Yes, I thought people would still want to play the game five years later after we released it, plus it would’ve jacked the cost of the cart some more and that was the last thing marketing wanted to hear with an unknown game. 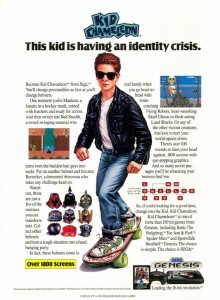 Sega-16: There’s a whole bunch of great and original ideas in Kid Chameleon, and it remains a fan-favorite to this day. Was there anything you wanted to implement but had to leave out? Steve Woita: I got everything I wanted to do in the game. I think if we had some more time I would’ve designed and programmed some more boss levels in the game. Sega-16: Why do you think the game was never turned into a franchise? Steve Woita: We to this day have no idea why Sega management didn’t allow us to do a sequel to the game. Even though we were totally burnt out from the first installment of Kid Chameleon, we wanted to take a few weeks off and start up a sequel to it right away. All of our tools to build the game were in place and everybody knew how to use them. I think the Sonic team started up Sonic 3 right around same time we were finishing up Kid Chameleon and a game called Jester was starting up, which soaked up a lot of resources. Sega-16: Any regrets about your time at Sega? Steve Woita: No. I really did like everyone there. I learned a lot and it was fun. I really do miss all of the people I ran into there. It was great to be able to speak to one of the legends of the American gaming scene, and Sega-16 humbly thanks Mr. Woita for taking the time to speak to us. To see what Steve Woita is currently up to, head over to his website, and be on the look out for a new PC title, soon to be available!